Designed around the RBG colour scheme, Fake Colours is a 3D cube rolling puzzle game in which the player must move three coloured blocks to their corresponding target squares. Don't be fooled by the simple, yet beautiful art in the game, Fake Colours is all about the puzzles. Game Blocks are able to roll on top of each other but are unable to roll onto tiles that are not their respective colours. The opening 10 levels won't take you too long to get through and learn, but don't be fooled into thinking this game is short or easy. The remaining 20 levels will take you hours and many cases days to complete. 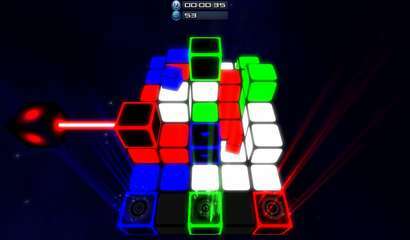 These puzzles grow in difficulty as the game progresses and later includes mini-coloured cubes that change the original cube’s colour once it moves through the mini-cube. Although simple to learn, Fake Colours is quickly becoming one of the most memorable puzzle games since Tetris. The ambient music and excellent vibrant graphics help create the foundation that makes Fake Colours addicting and fun!